A page already is on site about James Westoll & the James Westoll Line. This page covers other Sunderland ship owners - initially Robert H. Gayner & now Thomas Rose also - both assembled from data kindly provided by Clive Ketley, of the 'The Ketley Collection'. A small index to the present page content. Robert H. Gayner a fleet owner who would seem to have been in business for many decades - from 1854 to 1912 it would seem. In early 1968, a tiny 'Thomas Rose' vessel of just 315 tons, the Edenside, built by Richard Ironworks Ltd., of Lowestoft, was sold to 'North East by East Shipping Co. Ltd.' of Sunderland. The vessel soon became owned by 'N. Jadavji & S. G. Hirji' of Mombasa, Kenya. A tough little vessel most clearly - it lasted until Jan. 1995 when, after 54 years of service, it was broken up at Dar-es-Salaam. A modest image of Thomas Rose (c.1874/1949). Edenside the very last vessel in the 'Thomas Rose' fleet & its sale in 1968 ended the ship owning activities of Thomas Rose & successors which activities commenced way back in 1901. A period of over 65 years & two World Wars. The 'Thomas Rose' ships surely did all of that - also they carried cement from Denmark & Belgium, they traded to the Baltic & into the Mediterranean - but mainly they carried coal & other cargoes up & down the U.K. east coast from Sunderland to ports in Scotland & in the Shetland & Orkney Islands. Towards the end, however, such ships were unable to compete in the changing marketplace. Thomas Rose, ship owner, ship broker, shipping agent, coal exporter & many other things besides, initially owned vessels in his own name, i.e. 'Thomas Rose' or 'Thomas Rose & Co.' But in 1913 he both founded 'The Rose Line Limited' (known as 'Tommy Rose'), & through that company purchased Wylam Wharf. a wharf & related dock & warehouses facility located on the S. bank of the River Wear immediately to the west of the Bodlewell Ferry landing. Wylam Wharf? A long established wharf, then over 100 years old, owned, certainly in the 1890s, by French & Co, as you can see next. 'Bank Line Magazine', the staff magazine of Bank Line Limited, published in Feb. 1980 a 3 page article about 'The Rose Line Limited' written by R. T. Lambert (pages 1, 2 & 3). The article refers to the fact that Rose Line owned all of the bonded warehouses in Sunderland for then nearly 70 years. The author commented that a staff member of Bank Line who had dinner in a London hotel may well have drunk wines and sprits that had passed through the Rose Line bonded warehouses. And, should such staff member have chosen to eat lobster, it too may have come from Wylam wharf, where one of the warehouses contained large tanks containing live lobsters prior to being dispatched to hotels in the U.K. and to the Continent. The two companies, Bank Line & Rose Line, had in 1980 been associated for 45 years, Rose Line being the long term Sunderland agents for Bank Line. You might say there was an amazing continuity in the management of Rose Line! The initial partners were Thomas Rose himself, Norman R. Rose (Thomas Rose's son) & R. T. Lambert. Thomas was in the business until he died on May 12, 1949 as Chairman of the Board. (Some newspaper cuttings re his funeral.) Norman Rose, then with 56 years of service, took over as Chairman and Managing Director. R. T. Lambert, an original (1913) partner in the Rose Line shipping business, commenced employment with the company in 1925 & retired from it on Dec. 31, 1977 after over 50 years of service. D. J. Dorward, a Director and also Transport & Wharf Manager then had had 49 years of service. Ian A. Adamson was a relative newcomer when he joined the Board in 1979! Having had just 15 years of service. It was not only the management that had continuity. Many of the ship's captains clearly had lengthy service with the company. Captains George Russell & George Porter were two such captain who had many years of service. The corporate history? The data available to the webmaster is really quite fragmentary. Can you add to the history, perhaps? Initially Thomas Rose ('Rose1') was in business in his own name. The business would seem have become 'Thomas Rose & Co.' likely a limited company, yet ships would seem to have been still owned over the years in the name of Rose1. 'Wear Steam Shipping Company Limited' ('Wear1') came along in 1905. In 1913, Rose1 formed 'The Rose Line Ltd.' & it then owned Thomas Rose & Co. & Wylam Wharf. Durham Steamship Company Ltd. also came along in 1913. Wear1 likely went into bankruptcy or dissolution (can anybody confirm that?) in or prior to 1917 when 'Wear Steam Shipping Company (1917) Ltd. ('Wear2) was formed. Wear2 survived until 1931. In passing, 'British Coasters' of 1924 lists Rose1 & Wear2 as both being of 38 West Sunniside, Sunderland, which address was the company's registered office. Deeside Shipping Co., related in a way I do not know, would seem to have been a later company perhaps dating from 1946 thru 1959. There clearly were other companies less directly related to ship owning. 'Wearside Carrier Services Ltd.' as an example, had, I read, a fleet of 'platform lorries' & also 'two bulk powder tankers'. 1) Re Sunniside, 447 tons, built in 1905 by Goole Shipbuilding Company Ltd. of Goole. 2) Re Arnside, 532 tons, built in 1912 by the Sunderland yard of John Crown & Sons Limited. Re the same matter, Miramar indicate a little differently 'foundered off Aire Point, Land's End 10.2.14 (all 12*) [Birkenhead-Boston, bagged manure] i.e. foundered on Feb. 10, 1914 with the loss of all 12 lives, while en route from Birkenhead to Boston, U.S.A. An Australian Arnside newspaper cutting is here. 3) Also, earlier re Arnside, on Apl. 12, 1913, the vessel saved the entire crew of Frost, in the North Sea, as you can read below. .... he (Captain George Russell) took over the Arkleside, new in 1914, and on the declaration of war was ordered up to Scapa Flow where his ship was taken over as a transport. During the next 22 months the Arkleside carried cargoes of high explosives to Havre, Dunkirk, & Calais, and after surviving 320 air attacks remained as one of the three survivors from a fleet of 13 ships engaged on this "suicide" run. Perhaps her "gun" was Arkleside's lucky mascot. It was a pit-prop mounted aft to deceive the enemy. On it was painted "Thou shalt not kill!" An Arkleside newspaper cutting is here. 5) Re Cairnside, 559 tons, built in 1921 by A. Hall & Co., of Aberdeen. In Thomas Rose's own words:- 'I built the Cairnside No. 3. also at Aberdeen but she was also lost, coming from Granville to Hull. My Superintendent Engineer said he was not surprised at her loss as it was her 13th. voyage. She carried 13 men and it was a Friday.' The wreck took place off the island of Herm, W. of Sark, Channel Islands, on Jan. 14, 1922. The ship hit a rock. Captain C. Arundell was in command. All 13 of the crew survived - they could not, in the sea conditions, make Sark in their small boat. They landed at the Chouet on the north side of Guernsey. A Cairnside newspaper cutting is here. 6) Re Edenside, 366 tons, built in 1921 by J. & D. Morris, Pelaw Main Yard, Newcastle. On Jan. 3, 1922, Edenside, a new ship just over six months old, left the Tyne under the command of Captain John Olsen, with a crew of 8 & with an unspecified cargo. Her normal speed was 8 or 8 1/2 knots. The ship encountered appalling weather, hurricane force winds & mountainous seas & she ended up taking 44 hours to make Bridlington Bay, a distance of just 75 miles - a journey that would normally have taken the ship 7 or 8 hours. A big-time ordeal for the Captain & crew! Some newspaper cuttings re the voyage are here. The Captain & crew were honoured by the Mayor of Sunderland at a formal ceremony, held in the Mayor's Parlour on Apl. 30, 1922. On the same day that Edenside had left the Tyne, Elleray, 1201 tons, (ship not related to Thomas Rose in any way) had left Hartlepool for London with a cargo of coal. She was never heard from again - lost with her entire crew. I presume that she ran into the very same storm that hit Edenside. The following image is believed to be of the launch party at the launch of a 'Thomas Rose' ship. For a long time I have wondered which ship was being launched & have invited help in the matter. But now we have the answer thanks to James Smith, Thomas Rose's GGG grandson. James tells us the vessel being launched was Brookside and that the launch was on Sep. 23, 1922. It must have been at Goole where Brookside was built. It seems that that is Thomas Rose himself, prominent in the middle of the image. The young girl in the image, just to right of centre? Simon Flack advises, (thanks Simon! ), after a family discussion, that the little girl is in fact Doris Rose, Thomas's daughter. But .... a message has now been received from Chris Smith, Thomas Rose's great grandson, who rather indicates that it is the lady holding the bottle (at left in the image) that is Doris Rose. Chris further advises that Doris Rose upon marriage became Doris Shepherd, & that her daughter Kathleen Doris Shepherd later became Kathleen Doris Smith. Chris adds that he is not aware of the identity of the young girl just to right of centre in the image. I do hope that I have correctly reflected, in the text above, the comments of each of Simon Flack, James Smith & Chris Smith - certainly I have tried to do so. The text is easily amended if necessary. And next, a modest but interesting image of Thomas Rose. Can anybody tell us what the instrument is into which he is speaking - related to early wireless perhaps? John Liddle has come to the rescue! He tells us it is an 'Ediphone' - an early wax cylinder voice recorder - marketed by Thomas A. Edison Company in competition to 'Dictaphone', the product of Columbia Phonograph Company & others. Marketed from late 1917. 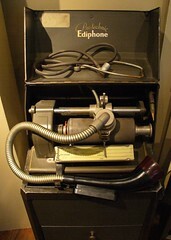 John kindly provided an image of an 'Ediphone' but you can find many images of such machines here. And here is a composite image of a 1920s 'Ediphone' machine. John, we thank you! In date of build order. Vessel foundered off Aire Point, Lands End, on Feb. 10, 1914 on passage from Birkenhead to Boston, U.S.A.
Sold in 1916 to Tower Steam Shipping Co. Ltd.
Sold in 1917 to Deneside Steam Shipping Co. Ltd.
Sold in 1922 to Tyne-Tees Steam Shipping Co.
On May 22, 1916, en route from Jarrow to Calais with a cargo of pig iron, the vessel was sunk by a mine from German submarine UC-10, 9 miles off Orford Ness, Aldeburgh. 6 lives were lost. On Jun. 13, 1917, en route from Sunderland to Peterhead with a cargo of coal, the vessel was sunk by gunfire from German submarine UB-41, 4 miles SE of Cove Bay, Aberdeen. No loss of life. The vessel went missing - it passed the Downs on Dec. 5, 1917 en route from Blyth to Jersey, with coal. The vessel was sold in 1955 to Bremner & Co., of Kirkwall, & renamed Orkney Dawn. Sold on Nov. 11, 1924 to East Coast Transport Co. of Newcastle. Sold in Dec. 1926 to Sea Transport Co. of Guernsey, & renamed Beauport. In May 1954 was broken up either at Gateshead or in Holland. On Jan. 14, 1922 the vessel struck a rock & was wrecked off the island of Herm, W. of Sark, Channel Islands. All 13 crew survived - their small boat landed at the Chouet, Guernsey. On Feb. 16, 1951, the vessel, en route from St. Peter Port to London, in high winds was wrecked on Vauxville beach near Cherbourg, France. At 49.38.20N/1.51.20W. Tugs were requested but the weather did not permit them to assist. No loss of life. Peter Gill advises us that the crew walked ashore! As per his guestbook message. Sold in 1958 & scrapped at Rotterdam on Apl. 8, 1958. On Feb. 26, 1942 the vessel left Hartlepool & went missing. Believed to have been sunk by an air attack. Sold in 1926 to Robert Rix & Sons of Hull & renamed Pegrix. Sold in 1930 to A. Chester of Middlesburgh, & renamed Moorlands. On Aug. 13, 1928 was sold to R. Hughes & Co. of Liverpool, & renamed Welsh Rose. On Jul. 20, 1959, the vessel was scrapped at Delfzijl, The Netherlands. On Apl. 6, 1965, the vessel was sold to G. & M. Amiridakis of Greece, & renamed Michael A. Sold in 1968 to North East by East Shipping Co. Ltd. of Sunderland & soon N. Jadavji & S. G. Hirji of Mombasa, Kenya. Clive Ketley advises me that Robert H. Gayner was a Justice of the Peace, and Chairman of the 'Sunderland and South Shields Water Co.'. He was a 'River Wear Commissioner' & on the 'Pilotage Board'. I do not have dates for the above however. Clive also refers to there being references to G. H. Gayner, maybe related, in trade directories, from 1867 to 1925. In 1867 at 68 Nile Street, in 1878 at 2 East Sunniside & in 1918 at Maritime Buildings on St. Thomas Street. A fleet list is below. That is about all that I know about 'Gayner'. The WWW references to 'Gayner' are essentially non-existent. Maybe you might add to the knowledge? A list of fleet vessels. While I have tried to make it both complete & accurate, errors can easily 'creep in' when you access multiple sources for data. Corrections (or additions) are invited. Please note, however, that Robert H. Gayner might best be described as the managing owner. He did own 100% of a number of the vessels listed below, (Warden Law built 1862, Derwent built 1868, & Northernhay built 1885). But he seems not to have owned 100% of the others. Vessel ownership was in 1/64th shares. So re Avon, built 1859, as an example, he owned 48/64 of the vessel with the balance, of 16/64, being owned by H. F. Fisher, an investor in the ownership of that particular ship. And so on through the other ships named. W. R. Abbay & Co.